A picture of the man supposedly resurrected from the dead by Alph Lukau. A 'resurrection' turned out to be fake, but in keeping with the myriad of wondrous feats Africa's self-styled preachers and prophets claim. Millions are in awe of these 'men of God' who claim to cure AIDS or ring up God. 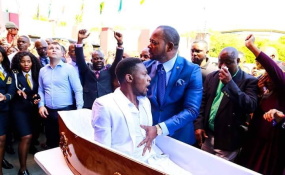 A video of South African preacher Alph Lukau purportedly raising a man from the dead at a funeral went viral in February. The "resurrection" was exposed as a hoax and Lukau is still being mocked on social media, with some people asking him to bring Nelson Mandela back to life. Lukau is the wealthy founder of the Johannesburg-based Alleluia International Ministries and only one of many 'miracles-makers' circulating in Africa. Self-proclaimed Zimbabwean prophet and doctor Walter Magaya announced in October 2018 that he had found a cure for HIV/AIDS. The head of Prophetic Healing and Deliverance Ministries told his congregation that his "scientifically-proven" cure involved two plants, one found in Zimbabwe and the other in Mozambique. Magaya said his ambition was to find a cure for HIV/AIDS and cancer, and that he had tested his potion on a number of HIV-positive people who had subsequently proved free of the virus. Shepherd Bushiri of Malawi can be seen walking without his feet touching the ground in a video on YouTube. The popular 'prophet' who founded the Enlightened Christian Gathering has a strong following across Africa. He has claimed that God blessed him with the power to perform miracles. Bushiri claims to have cured people of HIV/AIDS, made the blind see and changed the fortunes of the impoverished. Tens of thousands of followers gather to hear him preach at services where "miracle oil" and T-shirts and caps emblazoned with Bushiri's face are for sale. Bushiri is one of Africa's wealthiest 'prophets.' In addition to his church activities, he has stakes in several mines and owns four private planes and a string of hotels. He is currently facing charges of fraud and money laundering in South Africa, where his church and businesses are based. South African preacher Lasego Daniel of Rabboni Centre Ministries encouraged his followers eat grass to 'be closer to God' before, in 2015. At one service near Pretoria, dozens of people dropped to the ground to eat the grass. He has also urged his followers to drink petrol. Daniel's controversial methods, which also include him walking on his followers, have drawn criticism. Pastor Paul Sanyangore's is seen 'talking to God on the phone' during one of his church services. A video of that chat went viral in 2017 and caused major uproar. The pastor claims God gave him the direct number and often calls him up to give him advice on how to help people in his church. Sanyangore, also known as "Pastor Talent," said he planned to launch a TV show entitled "Heaven Online," where he would let people listen in on his phone calls with God. Sanyangore withdrew an offer to give people God's number at a special service at his Victory World International Ministries, saying the time was simply not right. A video circulating on social networks in 2015 showed Zimbabwean preacher Emmanuel Makandiwa asking all those who had belly fat problems to come forward. A woman who appeared to be carrying a few extra kilos around the waist stepped out of the crowd to be "healed." A UK-based website later analyzed the video footage of the popular Harare preacher and claimed that he used cheap tricks to fool people. ZimEye said it found that the woman who had 'volunteered' to be healed actually worked for the Makandiwa. A woman who had stood behind her in front of the congregation had deflated a balloon stashed inside the woman's dress, ZimEye said.